Wine funnels are not used as commonly today as they were in the 18th and 19th centuries, but they still have a practical function today, particularly for amateur wine connoisseurs. The purpose of a wine funnel is to assist in the decanting of wine from one bottle to another, sifting out any sediment, making for an improved taste in the wine. Wine funnels are usually rounded, with a sieve-like material across the bowl, and a thin spout extending downwards, allowing for the wine to be properly filtered through to a bottle, decanter, or other container. Frequently, the spout is curved to one side, allowing the wine to run down the side of the bottle, avoiding aeration, which can agitate the wine and affect its taste. 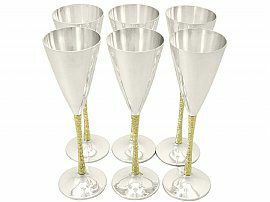 In the 18th century, wine funnels and wine funnel stands were frequently made out of silver. Some wine funnels were made of three composite pieces: the wine funnel, the wine funnel stand, and the filter itself. In these examples, the filter is detachable, allowing for a more thorough clean of the item. Often, the filter was a separate part of the wine funnel, but was connected to the funnel via a small chain or fastening. 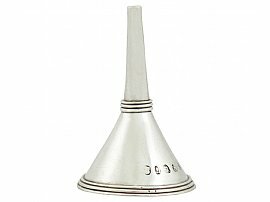 The value of antique wine funnels today is largely dependent on their design and condition, as with all items of silver. 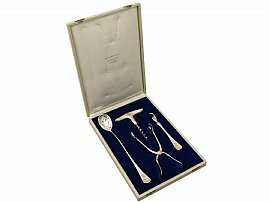 Finding a genuine antique wine funnel in excellent condition is considerably difficult now, leaving people very reliant on hallmarks to extrapolate whether or not an item is the genuine article.